The new Torbal model ST-1 dial balance guarantees long-lasting, dependable accuracy. There are no knife-edges or friction pivots to be abraded by use, no loose weights to slow the operator. Instant silicone-fluid damping eliminates arrestment in handling dial and beam. The new Torbal meets them all. 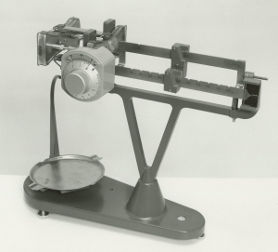 It has the same exclusive no-friction, no-knife-edge construction that has been standard in Torsion’s line of quality laboratory balances for over seventy-five years. The fine-weighing dial mechanism has proved itself in thousands of Torsion’s laboratory balances over the last five years. The fine-weighing dial mechanism has proved itself in thousands of Torsion’s laboratory balances over the last five years. The C-shaped bow, 7 inches high, affords maximum access to the stainless steel pan which is notched for test tube stability. The pan is 5” in diameter. A specific gravity rack and a stirrup hook are buit in. Dial range is 0 to 10 g, readable with vernier to 10 mg. Total capacity is 310 g which the two notched beams, calibrated 0 to 100 g in 10-g divisions and 0 to 200 g in 100-g divisions. Accuracy is +/- 10 mg and sensivity at full load is 5 mg. Dimensions: 14” by 5” by 13”. Net weight: 12 pounds.